In my head, I’ve totally been participating in the NaKnitSweMoDo (or whatever it’s called when you pledge to knit a sweater a month for a year), but so far the 3rd month of the year is coming to an end and I have only finished two sweaters. Oh well. Hope springs eternal, yes? 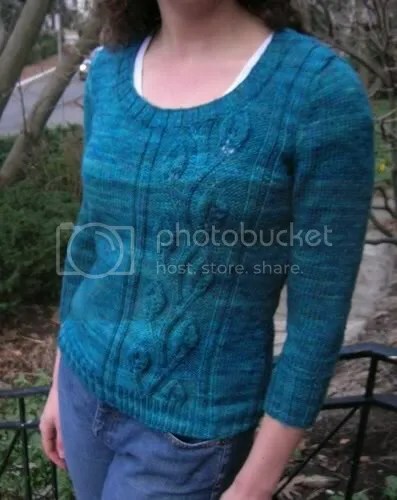 This is also my second from last Winter’s Interweave Knits – the Climbing Vines Pullover by Joelle Meier Rioux. I call it a win. Sadly the late-March weather has been giving a lot of clouds and not quite as much outdoor photoshoot light as one might prefer, and some of the best shots came out slightly blurry. Perhaps fittingly so, given that the yarn is Dream in Color Classy ‘Blue Lagoon’, and it certainly does have an ‘underwater’ look about it. I’m happy with the ease on this, I worked it for about 2 inches of positive ease and it fits comfortably. I did add about 1.5 ins of length overall and wish now that I’d added about an inch more, but I’ll live. It’s comfortable, relatively fitted, and I can happily go out into the world in it this spring. Tall girls, take note – definitely one for the modifications. Another thing I will note about the pattern is that the sleeves are quite snug. If I were to do it again I’d add 4-6 sts at the beginning of the cuff and adjust from there. The 3/4 sleeves are great for spring but are less accommodating around the muscles of your arms when they hit mid-forearm. The Dream in Color is designed to prevent pooling, however between skeins there was the occasional variation in colour and consistency, so I alternated skeins every 2-3 rows while working the body. I still ended up with a bit of flashing, as you’ll note from the pictures above, but at least it’s an overall effect. You can see an example of this on the shoulder, where the top 2 inches were done in a new skein, and the colour changed obviously. Because this was mostly stockinette, I was able to work through it pretty quickly during my evening knitting time, and the actual knitting only took me 15 days. Now I am left with the decision, once again, as to which sweater to make next. Naturally this means that I have since cast on 2 new pairs of socks and one shawl, but no new sweater yet. Stay tuned as further news bulletins occur on that front. And finally, I am really looking forward to a bit of rest in a few weeks when the term comes to an end, as I have once again picked up the current variation of viral plague circulating throughout Ontario, and would very much like to stop coughing some time soon. Thankfully the new Sock Summit website is up to distract me, my plane ticket to Portland is now booked for August, and Rebecca and I are already plotting. How soon is August? Can it be August now? At least April will be here soon. I see lace knitting in my future. Your sweater turned out beautifully! I love the look of this sweater, but there are so many mods I’d need to make it work for me. Yours is perfect on you! Just beautiful! I love the color and the fit really does look perfect on you. I anticipate you’ll get a lot of wear out of that this spring. Can’t wait to see what sweater you pick next! stunning! love the color, and the fit is lovely. looking forward to seeing what you cast on next! Gorgeous! And hey, once the term is done, you can probably knit two sweaters in May or June…. (especially if short-sleeved or sleeveless summer sweaters count). Beautiful sweater. I love it! Lovely sweater! Too bad about the little bit of flashing, but I think it looks great. Gorgeous! And I don’t think the flashing detracts from it at all – its not like you have big patches of lighter or darker tones in weird places. I bet it looks great with your latest pair of socks! Can’t wait to see the next pattern you choose, and hang in there – the last few weeks of the semester are always the hardest! That is beautiful! The color is very pretty and I just love the climbing vine pattern. Congrats on being 2 for 2! SO Very Beautiful! Well done! You wear it well, looks lovely on you! Fantastic job, and what a gorgeous colour. It’s gorgeous! I love the colour.. yum. Oh, I love that color. I may have to find some- it’s that lovely varigated solid that’s so hard to not get to pool. Great colour. I like how it matches your jaywalkers! Love your new jumper, it looks much better than it did in the magazine!! Good luck with the 12 in 12 challenge!! It’s lovely! What a pretty color. Holy cow, that came together quickly! Looks great on you. Thanks for the tip about the sleeves. I’m so jealous that you’re going to the Sock Summit. Hope you feel better soon. 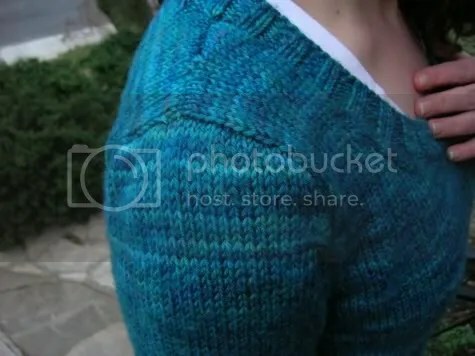 Your pullover is beautiful: pattern, color, execution… I’m considering making this pattern. Congratulations! 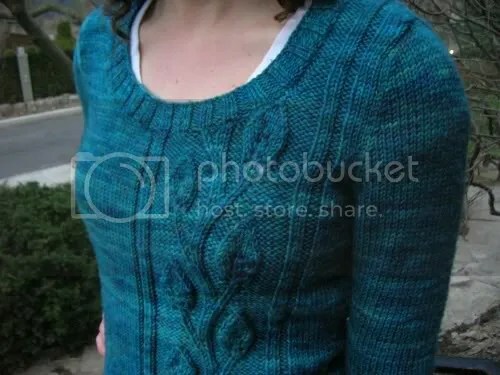 the sweater looks great, i love the color and i can barely tell about the top 2 stitches, i would never have known. i love the color variation in the blues. sad to hear ontario isn’t producing the nicest weather – my mother said it was freezing today. new york has been signifigantly warmer which i think is strange. Wow, that sweater is stunning! As always, you do beautiful work. It’s gorrrrgeous!! Or, as I learned to say in the South: “Idn’t it purrrrrrty!” Would that I could churn out adult-sized sweaters at your pace! I have some DiC smooshy waiting to be turned into viper pilots, BTW…as soon as I finish up a couple other things. Wow! What a lovely sweater and I agree with Adriana, you do beautiful work. Wow, it’s just beautiful! I actually really like the flashing bits because, as you said, it gives an underwater effect. Lovely job, congratulations! Love this pattern, the climbing vines are wonderful. I love nature inspired patterns. It looks great! I’ve seen a few nice FOs of this pattern. Perhaps this should go on my ever-increasing list of sweaters to knit. That is a wonderful coloured sweater. It looks a perfect fit. The sweater looks amazing. The colour is great as well. Great job. I wouldn’t worry about only being 2 sweaters in 3 months — now kind of is a crazier time of year than normal, right? Once you get a big break you’ll probably crank out a few sweaters and catch up. P.S. Great looking sweater, all thumbs up. 🙂 I definitely want to make one for myself someday too, although I was imagining it in a light cream color so that I can feel dressy in it. I love the color! I’d love some sock yarn in exactly that color. Bravo! It looks great on you. Don’t worry. You can catch up on the sweater knitting in no time. The sweater is gorgeous! You’ve got mad skillz, Girl! Beautiful! It fits you well, and the color is gorgeous! Lovely sweater! The colour is gorgeous, and I like the neckline and the way the cable just goes up one side. The pullover is lovely & fits you so perfectly. Love the color too. Absolutely gorgeous! You made an excellent color choice and the fit is perfect! I’d call that one a score. Such a lovely jumper. I’m just about to vast on for my first ever jumper,and I’m hoping that the project will help me to improve my knitting speed! Love that sweater! It fits you wonderfully and what a great color!